In this gallery works are grouped by theme in terms of still life, landscape and interior. The late Tate curator and art collector David Brown was impressed by the structured and sensual nature of Rose’s landscapes and encouraged her to explore the subject further. The paintings selected here express the artist’s ability to create a painting that includes strong abstract elements, such as those in the vigorous works Winter, Botallack and Yellow Interior, whilst still retaining their figurative source. Rose is adept at using flat planes of colour and tone as form, whilst still allowing the structure of the drawing to be visible. 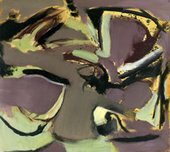 Whilst a student at the Royal College, her work was dominated by the exploration of space and it was Roger Hilton who later taught her that when you put one colour down, what you put next to it is of the utmost importance. And, when you change the colour, you must change the tone. Four new paintings each measuring 122 x 183 cm were created in 2007 for this exhibition and a small selection of landscape drawings reveal the artist’s working practice.